What Are Chicken Gizzards, and How Are They Used? Chicken gizzards are a popular food throughout the world. You can find them sold as street food in Haiti and Southeast Asia and in soup in Mexico. In Africa, they're served fried, boiled, or grilled, and in Europe, they're featured in salads and pâtés. A gizzard is a muscle found in the digestive tract of a chicken. If you've ever seen chickens pecking away at the ground, they are in fact swallowing tiny bits of grit and gravel, which travels through the chicken's digestive tract and eventually lodges in the gizzard. Then when actual food arrives, this powerful little muscle contracts, like a tiny fist squeezing a handful of gravel. The gravel grinds up the food, and the food continues on into the stomach. Gizzards are very small, with a distinctive taste that resembles dark chicken meat, but with a chewier and tougher texture. Cook them the way you would cook barbecue brisket, pork ribs or oven-braised pot roast—low and slow. The average cost of a pound of chicken gizzards is about $1.50 (or less). The best way to cook gizzards is slowly, with moist heat, at a low temperature. That's because if they hit high heat, as in a saute pan, the connective tissues will tighten up and squeeze the gizzards into chewy little balls of shoe leather. Instead, the goal is to cook them slowly over low heat, so that the connective tissues relax and melt away. Aim for between 180 and 205 F. The name for this type of gentle cooking is braising. Whatever you do, don't let them boil or they'll be tough. After an hour or two of gentle braising or simmering, all that connective tissue will soften and turn into gelatin and the gizzards will be nice and tender. You can either serve them or let them cool, dry them thoroughly, then bread them (or batter them, if you prefer) and deep fry them until crisp. Then serve with garlic aioli and swoon. Slow cookers are great for braising gizzards. Each model is different, but you probably want to use the low setting, which is around 210 F. It might take eight hours for it to reach that temperature, so refer to your manual. What Do Gizzards Taste Like? Since they're muscles, gizzards are meaty little morsels, with a deep, rich, dark-meat chicken flavor. Gizzards are one of a loosely defined group of miscellaneous chicken parts known as the giblets (which also includes the heart and liver). These are the parts you find in the little bag usually stuffed into the bird's cavity—but the gizzards can be purchased separately. Gizzards can go into anything: Tacos, enchiladas, bolognese sauce, lasagna, not to mention soups, chili, and fried rice. They're also terrific served slightly warm with a plate of greens. Chop them up and add them to your homemade stuffing. Or wrap them with bacon and deep fry until crispy and serve as fancy hors d'oeuvres. It's best to chill the gizzards before slicing because they'll be firmer and you'll get a cleaner slice. If you buy gizzards from a local butcher or even better, a poultry farmer, be sure to ask if they've been cleaned or not. If they haven't you can ask them to do it (they might charge you for this) or clean them yourself, which is not pleasant but must be done because of the grit that resides in the gizzards. Commercial gizzards you buy at the supermarket will be cleaned already. You should be able to find them separately, next to the hearts and livers and so on. But if you don't see them, ask the butcher. 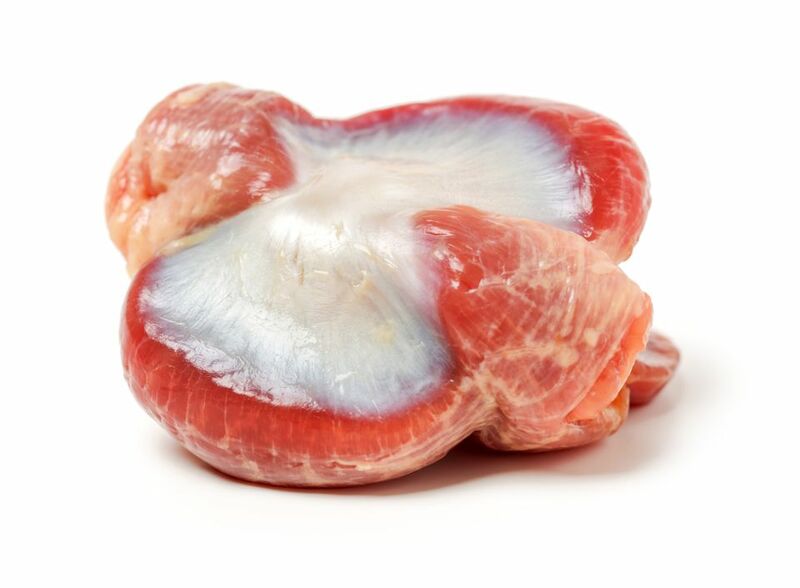 Fresh gizzards should be the last thing to go into your cart at the store—they should feel cold to the touch—and the first thing to go into the refrigerator when you get home. Place fresh gizzards in a disposable plastic bag to contain any leakage that could contaminate other foods. Store them in a refrigerator set to 40 F or below and use them within a day or two. You can also freeze them at 0 F and they will keep forever, but for the best quality, you should use gizzards within four months of freezing. A one-cup serving of cooked chicken gizzards contains 223 calories, 44 grams of protein and 4 grams of fat, including 1 gram of saturated fat. They are an excellent source of iron and zinc, but high in cholesterol (536 milligrams) so they should be consumed in moderation.